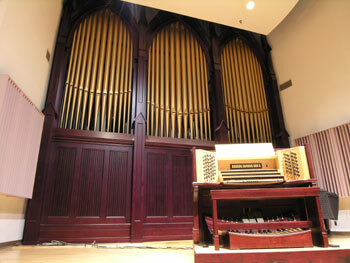 The Isabelle B. Harris Organ was built in 1994 by Schoenstein & Co., Organ Builders, San Francisco, California. The late Dr. Roy A. Johnson, professor of organ (1966–1995) worked closely with Jack Bethards, president, Schoenstein Co., in designing the organ’s specifications. 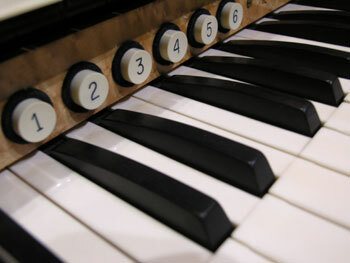 Professor Johnson’s vision was to create a teaching and recital instrument, using an economy of resources, that would encompass all organ literature, not necessarily authentic to a particular period, but which would give students the experience of working and learning on a versatile instrument typical of the organ architecture they would most likely encounter in their future careers, whether it be as recitalist, teacher, or church musician. 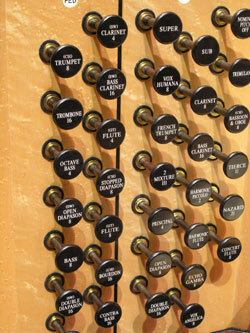 The organ has 27 voices and 33 ranks on three manuals and concave pedal board with electro-pneumatic action. The Vox Humana stop, from an historic instrument, was donated in Professor Johnson’s memory by his son, Eric Johnson of Quimby Pipe Organs, Warrensburg, Missouri. It was through Professor Johnson’s vision and long-time dedicated efforts that the University of Arizona Holsclaw Hall and Schoenstein organ were built. Isabelle Harris, donor of funds for the organ, selected the Gothic case design. Dr. Pamela Decker is Professor of Organ/Music Theory at The University of Arizona.